Shoulders: Shoulder blades are long, flat, fairly close set at the withers and well laid back. The upper arm, which should be relatively the same length as the shoulder blade, attaches at an approximate right angle to the shoulder line with forelegs dropping straight, on a perpendicular to the ground. Topline: Back is straight and strong, level and firm from withers to hip joints. The croup is moderately sloped. Chest is not broad but is deep with the lowest point reaching the elbow. The ribs are well sprung and long, neither barrel chested not slab-sided. The underline shows a moderate tuck-up. Front & Hind: Are oval, compact with close knit, well arched toes. Pads are thick and resilient. Docked: Docked tail is straight, not to exceed four inches in length. Blue merle, black, red merle, red - all with or without white markings and/or tan (copper) points, with no order of preference. The hairline of a white collar does not exceed the point of the withers at the skin. 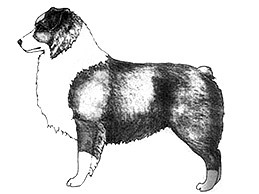 White is acceptable on the neck (either in part or as a full collar), chest, legs, muzzle underparts, blaze on head and white extension from underpart up to four inches measuring from a horizontal line at the elbow. White on the head should not predominate and the eyes must be fully surrounded by colour and pigment. Merles characteristically become darker with increasing age.